Dynamics CRM 2013 has the ability to display an image inside the form but in my opinion too many clicks are required to change it. First you need to click the picture box, wait that the dialog is loaded, click browse..., find the picture in your pc, click Open and finally click OK. It is necessary to add the library to the form and attach the InitializeMugShot function to the OnLoad event. 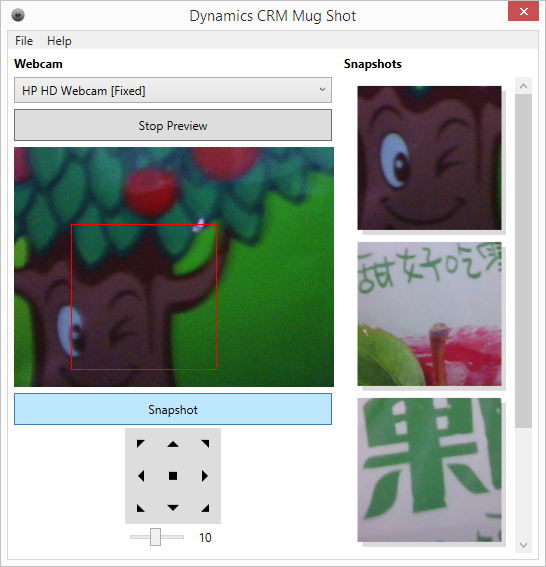 The snapshots listed in the right part are draggable, so you can drag the snapshot you just took from your webcam directly to the CRM picture box! (or you can drag them to the desktop if you want to save as file).